Fiction: Missing by Cheryll Snow | LADY. Beatrice sits on the edge of the bed, her upper body tilted forward, like a baby bird leaning precariously out of its nest. Strange hands lift her arms and help her into her slip. She stares at the ebony face in front of her. She can’t place the young woman as the aide applies a touch of rouge to Beatrice’s cheeks and brushes out her silver-white hair. Who let this person into my home? She looks around. She doesn’t recognize the room or the furniture. Through the doorway, she spies a china cabinet filled with dinnerware. Those dishes aren’t mine! Where is my crystal? My Hummel figurines? The aide takes hold of Beatrice’s hands and places them in her lap. “It’s okay, Mrs. B,” she says softly. “Out! Ou...” Beatrice looks. The low sky is the color of steel and the trees in the distance are bare. Beneath the windowsill, a layer of snow covers the tops of the rhododendron bushes. Like frosting on a cake. “Pretty, pretty,” she murmurs, staring out the window. “You’re right about that, Mrs. B,” the aide tells her. She lays a skirt and blouse on the bed and Beatrice’s attention is drawn to the faded quilt. She pushes the items aside and runs her hand over the fabric squares. Suddenly, she sees this same quilt stretched across the lower limbs of a magnolia tree. From beneath the canopy comes the sound of muffled giggling as Beatrice plays a game of hide-and-seek with her granddaughters. “Now where can they be?” she asks in mock bewilderment. Peering into the open space, she sees the girls’ small forms huddled together on the ground with their backs to her. “Boo!” she calls out. The girls scream in unison, then burst into peals of laughter as the youngest falls forward, pulling the tent down with her. Beatrice smiles, not in response to what the aide told her, but at the laughter of her granddaughters echoing back to her through the crippled maze of her mind. “Where are my girls?” she asks. Her train of thought is derailed, and she turns away. The aide helps her into her stockings and shoes. Beatrice catches her reflection in the mirror. She doesn’t recognize the image as her own. Gone forever is the pleasing figure that attracted many a suitor as she walked past. The youthful hipbones which cradled the weight of three unborn children have become porous and brittle with age. And her long, shapely legs, once considered to be her best asset, are now blue-veined and frail, as pale as the underside of a fish’s belly. The aide prattles on as she buttons Beatrice’s blouse and skirt. Something about today being a very special day. But the words bounce off like pebbles against glass. Shuffling down a short hallway, Beatrice stops in front of a grainy, black-and-white photograph of a young man dressed in uniform. Her late husband’s name reverberates in her head, first a whisper, then louder and louder. She smiles. She’s fifty years younger, waiting at a train station. She sees Phillip as he steps off the train, tall and handsome in his Army uniform, his duffel bag slung over his shoulder. A whistle blows. The conductor takes out a watch from his vest pocket and gives the final boarding call. Chicago! That’s where it was! Phillip had greeted her that day with a chaste kiss on her cheek. He took her dancing that evening. And that was the night they fell in love. Beatrice starts to hum a lyrical tune as the aide guides her through the entrance door to her suite. She can’t recall all the words, but she remembers the last few lines as she and Phillip float across the floor. She makes her way down a wide carpeted hallway to a large dining room. She sits at a large cherry table decorated with pine boughs and red candles. The sounds of music and muffled voices filter softly around the room. But it’s only when a man she’s never seen before, dressed in a charcoal gray suit, leans over to kiss her cheek and wish her a merry Christmas that she realizes the significance of the day. A woman in a red dress stands next to him, smiling. 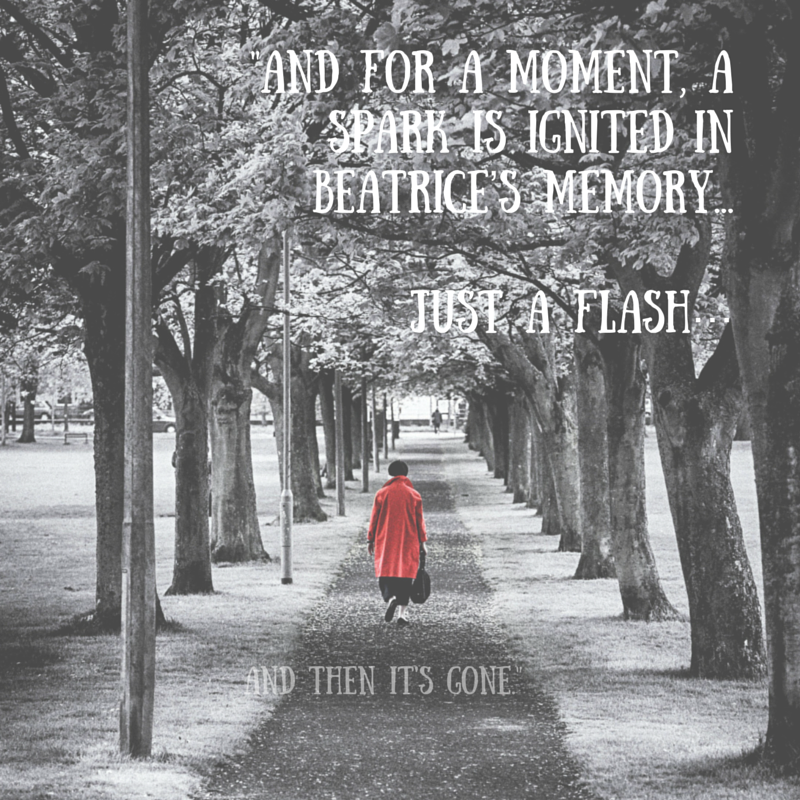 And for a moment, a spark is ignited in Beatrice’s memory. Dinner is served, and Beatrice looks down at the chain of holly leaves along the edge of her plate. The woman in the red dress sits next to her. She talks quietly to Beatrice throughout the meal. Something in the sound of her voice makes Beatrice feel good inside. She’s not sure why. The ham tastes delicious. So does the cranberry sauce. Fresh, just like she used to make. But she doesn’t touch her mashed potatoes. No lumps. Must be instant. Someone sets a slice of pumpkin pie in front of her. She stares at it. Something is missing. Then a dollop of whipped cream is placed on top of the pie and she smiles. She picks up her fork and takes a generous bite. The woman in the red dress laughs. Beatrice looks up to see everyone at the table smiling at her. Back in her suite, the woman in the red dress sits across from her. She catches snippets of the conversation floating around her. Beatrice awakens with a start. The woman is now beside her on the sofa, holding her hand in her lap and smiling at her. “Mom, we’re leaving now,” she tells her. The woman in the red dress tries to comfort her. “It’s okay, Mom. It’s me, Margaret Anne. Don’t you recognize me?” She reaches out to take Beatrice’s hand, but she snatches it away and pulls herself up from the sofa. “Don’t you touch me! I don’t know who you people are! You shouldn’t be here!” She backs away toward the kitchen. She grabs a silver letter opener on the counter and holds it out in front of her. A blur of white uniforms appear. Strong hands grab hold of her and pin her arms to her sides. “Please! Don’t let her hurt herself!” the woman in the red dress cries. “Easy now, Mrs. B,” a male voice tells her. “You’re okay.” The orderly pries the letter opener from her hand. Beatrice screams over and over again for someone to help her. Soothing voices reassure her as she is led back to the sofa and made to sit down. Within a few minutes, her mind begins to calm and her eyelids grow heavy. She’s asleep when the woman in the red dress leaves with the man in the gray suit, her hand clamped over her mouth to hold back the sobs. Strange hands again. Different face. Helping her put on her nightgown. “Busy day, Mrs. B?” the girl asks. She slides into bed beneath the cool, crisp sheets. The aide bids her goodnight. Outside, it starts to snow again. Beatrice watches the fat, lazy flakes swirling around in the gusty air. Around and around… until they fall to the earth, silent. Like the ones captured inside those plastic snow globes she used to have when she was a girl. The tune she was singing earlier in the day returns to her in the cocooned silence of her room. Her eyes grow heavy once again. Her last thought before falling asleep is of Phillip. And in her dreams, they dance. 4 comments on "Fiction: Missing by Cheryll Snow"
Powerful. I don't think I've ever read anything from this point of view. My husband and I watched dementia take over my mother-in-law's being. There were days when she thought my husband was someone else. He struggled with that. Her caretakers at the assisted living facility were nothing short of angels. Great piece! Thank you for sharing, Amber! And we agree! This is one of our favorite pieces! Thank you for your review, Amber! I'm glad you were able to relate to it.